Faces are central to the visual component of human interaction. Classic examples of this include face recognition and visual focus of attention (V-FOA) analysis. 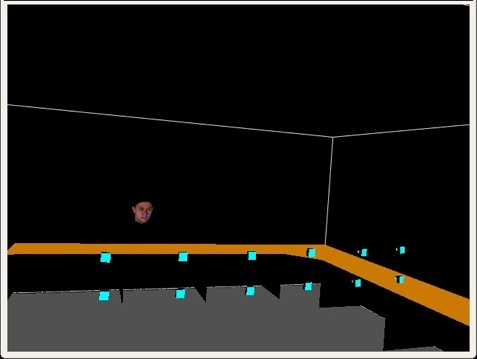 For a computer vision system to be able to perform these tasks in a generic environment, it is necessary not only to locate the face within the image, but also to estimate the pose of the face, that is, the orientation of the face in some coordinate frame. As an example of a face pose estimation system, we introduce the Intelligent Shelf project. In this project, we envision a grocery-store shelf lined with small, unobtrusive cameras. As a person peruses the contents of the shelf, the cameras would detect the pose of the person's face and estimate where on the shelf they are looking. This information can be used to improve the ergonomic design of stores and improve the layout of items within the store, to make things easier for customers to find. 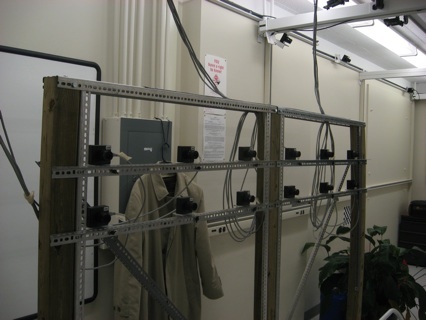 As an initial prototype, we have constructed a vertical frame, shown in Figure 1, which represents the shelf, on which we have mounted twelve cameras. 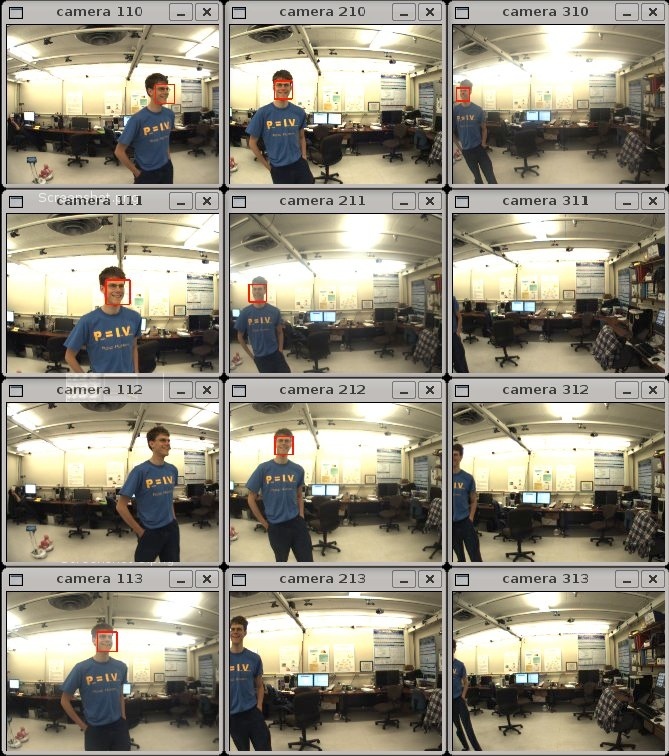 These cameras capture a multi-view sequence of images of persons in front of the camera wall, shown in Figure 2. To be used in large camera network like the one required for the Intelligent Shelf project, distributed processing of the camera images is essential. In this project, we are experimenting with techniques for efficiently estimating the pose of each person's face, minimizing the bandwidth requirements while maintaining the accuracy of the detections. Figure 3: Graphical user interface showing the estimated face position for the images shown in figure 2. This video demonstrates the range of positions and orientations which can be detected by our system. This video demonstrates that multiple people may be detected at the same time. The GUI uses a generic model, based on the average face from the USF Human ID Morphable Faces Database.